He was the son of John Edward and Ellen Cox of Balscote and the husband of Fanny Mary Cox of Midemoya, Manitoulin Island, Ontario, Canada. 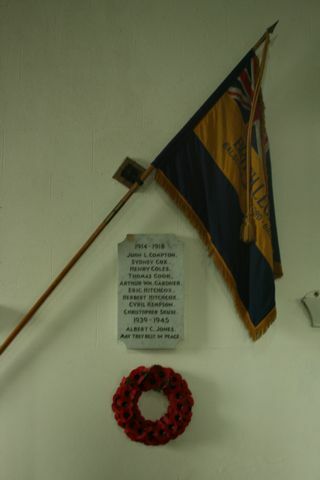 He had served with the Hampshire Regiment Army no 17281 before WW1 enlisting on 14 June 1908 when he was 22. He was wounded in Gallipoli on 6 August 1915 and discharged on 26 October 1915. He then re-enlisted as Gunner, 2nd Siege Artillery, Reserve Brigade, Royal Garrison Artillery, Army no 283287 on 24 May 1916. He was discharged on 29 March 1918 and died almost immediately at home. His death is registered as a civilian in Banbury in the quarter ending June 1918. He was 33. This is the name on the memorial but no soldier appears to have died who meets the information available. 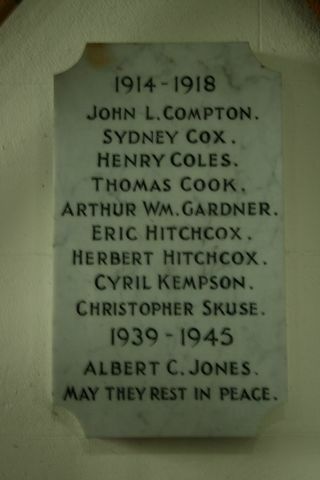 There was a William Cook who served from Balscote, he did not die but he was the son of Mrs Skuce, see below. He was killed in action in the fighting at Ypres on 22 August 1917. He was 35. He was the son of William and Sarah Hitchcox of Bolscote and the elder brother of Eric, above.